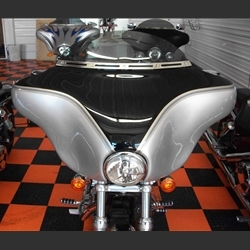 The Harley-Davidson Dyna Low Rider fairing attaches to Memphis Shade Adj. Clamp Brackets. We must know the Fork Tube Size. Spacers may be required to shim out to the fairing, the spacers are supplied. The headlight size is 5 3/4" and the location of the headlight is on the bottom triple tree (2206 or newer). Anything older than 2006 is probably in the clam shell and will have to be lowered to the bottom triple tree.